It is said that a Haflinger can do 2/3 of the work of a large draft horse such as a Belgian for 1/3 of the food costs. Haflingers are "easy keepers" and "willing workers" which make them ideal farm helpers. These Haflingers are working with Paul Nordan on his farm in Georgia. They are increasingly used for English and Western pleasure, dressage, and gymkana. .This is Magenta WULF, owned by Jack & Donna White, Monroe, NC. 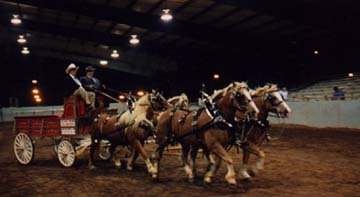 Ray Jacobs and Paul Norden with a 4 hitch that consists of 2 pairs working together for the first time - Albert and Mr. Matlock in front and Cleo and Cheeky Girl at the wheel. The gentle nature of the Haflinger and the sturdy physique enable just about any member of the family to enjoy and utilize him/her. They make wonderful trail horses and also can be used for packing. 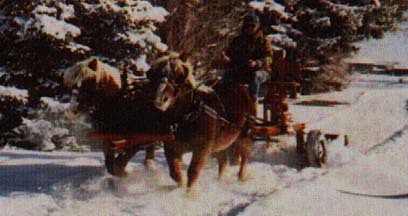 Haflingers are also used with handicapped riders. Haflingers make capable, calm but spirited, extremely attractive driving horses. They seem to enjoy stepping out and are said to actually love parades! 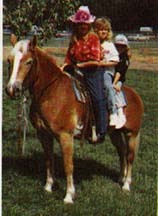 This Haflinger is Opal PKN and is being driven by Kathie Nordan of Georgia. Haflingers aren't afraid of the cold. Haflingers are just as happy to go out working in the snow as in the summer - perhaps even more so, since they originated in the colder mountain areas of Austria. They look positively merry covered in snow.